There are a plethora of Las Vegas Italian restaurants and here a list of ten that suits all types of foodies from families to romantic couples to trendy upscale diners. Families will enjoy the atmosphere as well as value at places like Battista’s Hole In the Wall, Buddy V’s Ristorante and Maggiano’s Little Italy serves family style. Upscale diners can enjoy specialties by a celebrity chef at Giada and Scarpetta brings bold new flavors to traditional dishes. You will think you are in a side street cafe in Venice while dining at Trattoria Reggiano and Il Fornaio is perfect for people watching. Romantic couples will like the intimate feeling at Fiamma Italian Kitchen, Carbone is a throwback to the classy Rat Pack days and the meatballs at Rao’s will make your taste buds dance. The Scarpetta is a superb Las Vegas Italian restaurant that brings a modern twist to old school Italian dishes and features homemade pastas with bold flavorings. Located on the third floor of the Cosmopolitan Las Vegas, the restaurant’s name translate to little shoe which is the shape that bread takes when lapping up the wonderful sauces of a dish. The interior of the establishment has a chic modern decor with excellent views of the Bellagio Fountains which will enhance your entertainment while dining. Signature dishes include spaghetti with tomato and basil, duck foie gras ravioli, veal chop parmigiano and short rib agnolotti. If you are not looking for a full dining experience then try happy hour where you will find small plates, a variety of cocktail specials as well as beer and wine for $7 an item or glass. When you are searching for a classy upscale Las Vegas Italian restaurant that resembles an elegant New York City eatery complete with tableside service then try Carbone. 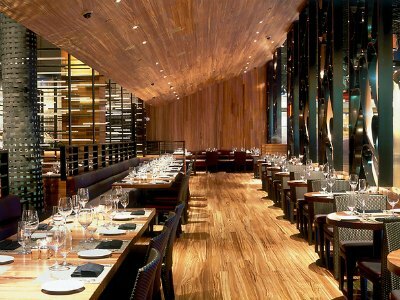 Located on the second floor of the Aria Hotel, the restaurant is fashioned after their name sake restaurant in New York City with heavy woods, Vegas memorabilia on the walls and an old school mobster meeting ambiance with music playing that ranges from the Rat Pack to Sinatra to Sam Cook. Open for dinner only, the kitchen turns out traditional favorites with a twist such as the Octopus Pizzaiolo, spicy rigatoni vodka, lobster fra diavolo and cherry pepper ribs. Although the establishment is pricey you do receive some added value like complimentary antipasto, freshly baked bread, pickled vegetables and even a limoncello after dinner. If you want showmanship order the banana foster for dessert which is prepared tableside. 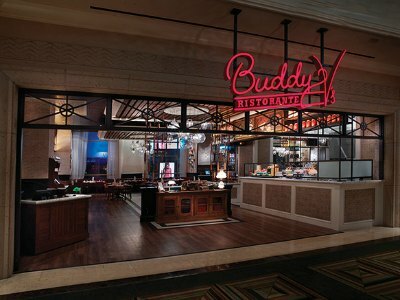 When the family gets hungry and wants to feel like they are eating at grandma’s house then a superb Las Vegas Italian restaurant for you to visit is Buddy V’s Ristorante. 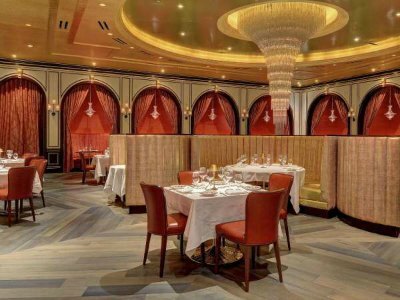 Located at the Venetian within the Grand Canal Shoppes, this is the first Las Vegas restaurant created by TLC’s Cake Boss which is open for lunch and dinner as well as for weekend brunches. The celebrity chef mixes a little bit from mom, grand mom and his aunts into a tasteful menu that offers specialties such as the Valestro Sunday gravy, Bucatini carbonara and Nonna’s lasagna al forno. The weekend brunch menu brings a huge buffet of delightful cuisine where the mac and cheese carbonara will tickle your taste buds. There is an extensive dessert list which includes a wonderful Nutella cake. If you are around near happy hour you can enjoy $5 small plates and drink specials. When you want to find an intimate Las Vegas Italian restaurant that has a cozy fireplace and quiet ambiance then you should go to Fiamma Italian Kitchen. Located within the MGM Grand, the Fiamma Italian Kitchen is open only for dinner and is ideal for foodies looking for a more chic rendition of traditional Italian dishes as well as a restaurant that is romantic or geared for a business dinner. The restaurant is known for several outstanding specialties which include short rib ravioli, lobster gnocci and a carpaccio that is finished with burgundy truffles as well as a tasty black truffle rigatoni. The establishment offers a wide selection of wines with over 700 bottle varieties in their wine cellar and an extensive wine by the glass list. Dessert brings a new twist to a tiramisu and indulging in the chocolate bread pudding could change your life. 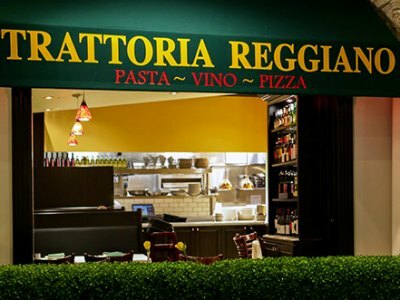 When you want to feel like you are visiting a side street cafe in Italy then an ideal Las Vegas Italian restaurant for you is the Trattoria Reggiano. Located within the Grand Canal Shoppes at the Venetian Hotel and serving lunch as well as dinner this casual dining establishment will bring joy to your taste buds with house specialties such as lobster ravioli, baked ziti as well as filet mignon meatballs that will melt in your mouth and you are treated to flavorful garlic knots after you are seated. After devouring your meal you should try the homemade ricotta cheesecake which is baked fresh daily. When you arrive you will have the option of sitting at a cozy table inside or you can enjoy watching the people while eating at one of the patio tables that will surely leave you with the feeling of visiting Venice. 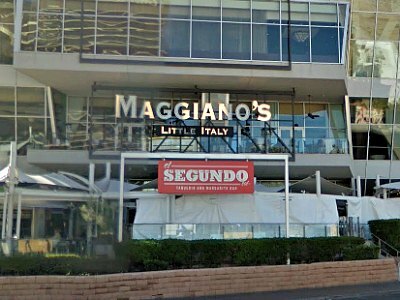 If you are interested in a Las Vegas Italian restaurant that specializes in homemade traditional dishes that are sure to please the whole family then you should try Maggiano’s Little Italy. Located along the Strip on the third floor of the Fashion Show Mall this family-friendly is open for lunch and dinner as well as brunch on weekends. The eatery serves quality dishes which are all prepared in the traditional Nonna style from scratch. Specialties include braised beef Contadina, Johnny’s carbonara and their famous rigatoni “D” is a crowd pleaser. You have the option of traditional dishes to be served family style which brings a number of pastas to the table that will surely please everyone. Brunch brings delightful cuisine to the table like lemon ricotta pancakes, braised beef hash and eggs as well as the Meatball which is their take on a creative eggs benedict dish. 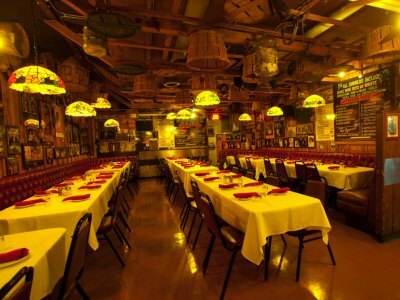 One of the best values you will find at a Las Vegas Italian restaurant is at Battista’s Hole In the Wall which has been in business for over 30 years. Located just off the Strip along Linq Lane, the restaurant offers an energetic atmosphere complete with an accordion player telling stories of the Rat Pack. On the walls you will find hundreds of pieces of Las Vegas memorabilia and photographs of famous people that have dined here. The menu is traditional Italian that adds value by including soup or salad, garlic bread, your entre of choice and the homemade cappuccino at the end is a winner with all diners. An added bonus during dinner is that you are treated to a complimentary carafe of house wine. Open for dinner only this establishment has been winning the hearts of their customers for decades. 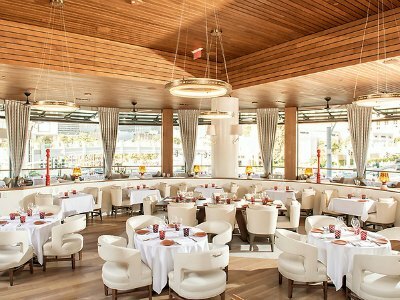 Giada is the first ever restaurant created by celebrity chef Giada De Laurentiis and is one of the hottest Las Vegas Italian restaurants. This bright and airy establishment is located within the Cromwell and brings a new fresh twist to traditional style Italian cuisine. Open for dinner nightly the restaurant has surged on to culinary scene with specialty dishes such as lemon spaghetti, rosemary focaccia and vegetable Bolognese rigatoni. Diners also enjoy an incredible view of the Bellagio Fountains while eating and they have a renowned wine list which is featured at a series of wine tasting dinners. Brunch is served on the weekends with unique dishes like lobster hash, salmon cake benedict and you can indulge in a wood-fired pizza such as the salumi piccante. If you are searching for authentic tasting Southern Italian cuisine served in a welcoming atmosphere then a great Las Vegas Italian restaurant for you to try is Rao’s. 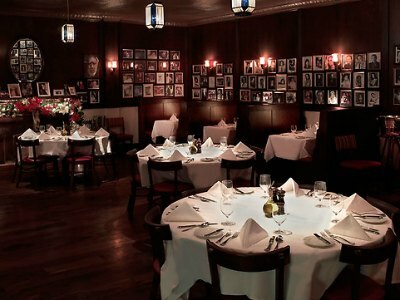 Located within Caesar’s Palace, Rao’s is a 12 table replica of their original New York restaurant which opened in 1896 and is one of the oldest family owned restaurants in that city. Open for dinner on a nightly basis you can also find seating in the bar area as well as the open air patio. The interior walls are packed with signed photographs of hundreds of celebrities that have visited the place both in Las Vegas and New York where it is virtually impossible to get a table. Signature dishes served tableside such as Uncle Vincent’s Lemon Chicken, the homemade meatballs as well as the Veal Chop with hot and sweet cherry peppers will not disappoint. 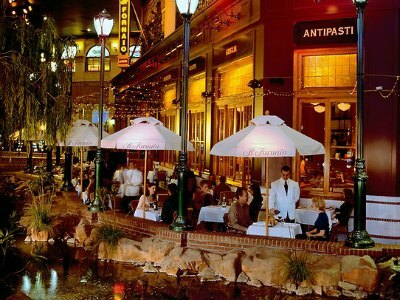 One of the best Las Vegas Italian restaurants for people watching, service and traditional cuisine is the Il Fornaio. 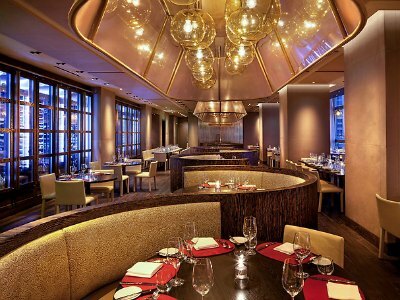 Located within the New York New York Hotel and Casino the restaurant serves traditional and innovative Italian dishes. Open for all three meals the establishment serves authentic and creative Italian dishes which include items such as eclectic pizzas, linguine mare chiaro, cannelloni al forno as well as lasagna ferrarese. The onsite bakery helps enhance the menu throughout the day with Italian baked goods and freshly baked bread which is served to every table after being seated. Another reason to visit is to people watch from tables that overlook the casino area or you can choose an intimate booth inside. Value hunters can look out for a two for one breakfast coupon which will put a smile on your wallet.